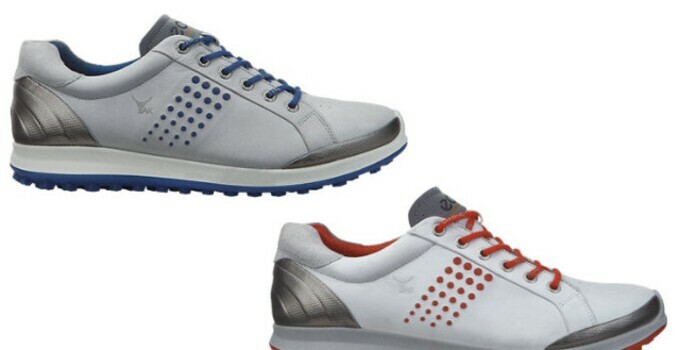 Ecco Golf is the standard bearer for hybrid golf shoes. Their initial Street model -- and its adoption by 1992 Masters champion Fred Couples -- drove a craze that's still influencing shoe design today. The shoemaker has evolved the concept since that first Street design, and its new Biom Hybrid 2 shoe is the next iteration in the family. The Biom Hybrid 2 is 15 percent lighter than its predecessor, thanks to a thinner midsole that also gets the player's foot closer to the ground for more natural motion. TPU material is used in the outsole for stability. The design approach was to provide more material where stability was needed and less where comfort was a must. The shoe's upper is melded to the outsole using the company's Direct Injection method, combining the two pieces together without glue or stitching, making the shoe even more water-tight. The Ecco Golf Biom Hybrid 2 shoes are now available in three styles for $195.